Display an external RSS feed. The RSS Display component reads an RSS feed from an external source and displays the entries as links. The RSS entries are displayed as an unordered list of links. To use the component, you specify the feed URL, which is supplied by the external site. For example, the URL for the ProtoShare blog feed is http://community.protoshare.com/feed/. To display multiple feeds, you must use multiple components. 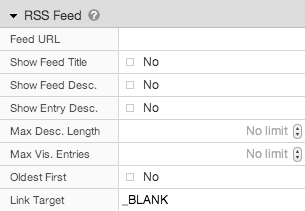 You configure the component by specifying the feed URL, number of entries to display, and whether to display the feed description, feed title, and entry descriptions. Feed URL The feed URL supplied by the external site. Show Feed Title Whether to display the title of the feed (if present in the RSS). Show Feed Description Whether to display the description of the feed (if present in the RSS). Show Entry Description Whether to show the description of each entry, in addition to its title (if present in the RSS). Max Description Length Maximum number of characters to display for each entry description. Leave this field blank to show the entire description. Max Visible Entries The maximum number of entries to display. Leave this field blank to show all entries. Oldest First By default, the entries are displayed in the order they appear in the RSS. This option allows you to reverse that order. Link Target Determines where the page is displayed when you click the feed link. By default, the link target is “_BLANK”, which opens the page in a new browser window. To open the link in the current browser window, specify the link target as “_TOP”.